The PURPOSE of this section is to provide suggestions based on my experiences and those of others who have participated in short-term ministry in Ugandan. It is hoped that this information will help others be better prepared for a safe, healthy, and fruitful ministry, ready to meet whatever challenges come their way. Not all the information here is mine alone. Others have sent suggestions following their return from Uganda and all such additions add to the richness of this advice. There remains the fact that some of this advice is a matter of personal opinion, preference, and experience, and not written in stone. I have attempted to make it clear when speaking of matters that following exact directions is required. Even small children in the US know to dial 911. However, that is very much an American thing. The corresponding number in other countries varies. However, mobile phones have a feature that if you dial 112 it will find a network with the best signal and connect you to their emergency system. This is said to work even on a locked key pad. I have never personally tried or even needed this. If you battery is very, very low, you can access reserve batter power by dialing *3370# and your phone will restart itself and provide some extra power in an emergency. First, check your phone's serial number by dialing *#06# and a 15-digit code will appear on the screen. This number is unique to your phone. Write it down and keep it somewhere safe. If your phone is stolen, you can phone your service provider and give them this code. They will then be able to block your pone so even if the thief changes the SIM card, your phone will be totally useless. Avoiding Travel Stress International travel creates stress for everyone but there are things you can do to minimize stress and its effects on you. In addition to the obvious "get plenty of rest and eat right" the advice listed below should help. Plan ahead to avoid last-minute panic. Follow the Trip Preparation Time Line, and Check List faithfully so that you do not have to spend the last few days in a whirlwind of activity or stay up all night just before departure. Arrive at the airport in plenty of time to check in, clear security, locate your gate, etc. In airports in smaller cities, at least two full hours before departure and at major airports, at least three hours. This allows adequate time to resolve any issues that might arise. Consult the Transportation Safety Administration website for their latest information on security matters. Be sure your medications are properly labeled and packed according to packing tips for prescriptions. Be certain to have on your person or in you carry-on anything that you must have should your bags be delayed or even lost. Cut back on sugar and caffeine before and during your trip. These stimulants will exacerbate anxiety and prevent rest. Control whatever you can around you, light, fan, seat position, foot room, etc. Be prepared to keep yourself occupied with reading material, music player etc. The aircraft has music, movies, and short videos, but you may not be interested in what they offer so have your own. Finally, do not stress over safety. You already survived the most dangerous part of your trip, travel to the airport! On my first couple of trips to Uganda, the excitement of international travel was so strong that I stayed awake the whole flight to Europe. Upon arrival, I was wasted. Now I recommend the following. First leg: on your way to Europe (almost always an overnight flight) sleep as much as you can. On you way from Europe to Uganda, stay awake as much as possible as the flight arrives late a night and you will then be ready to sleep upon arrival. This is to help reset your body clock. Soon after the meal has been served, I recommend you recline your seat, take a pain reliever, if you have sleeping pills, take one, then wrap up in the airline provided blanket, put on an eye mask and go to sleep. The pain reliever helps mask the lack of comfort in an airline seat. I am often asked to recommend a travel agency. The two that I have used and gotten great service from are Ministry Travel and Wilcox Travel. Both work faithfully with Christian missionary travel. At Wilcox our group has a long standing relationship with. Please understand these two recommendations are just my personal experience and I am sure there are other fine agencies that can help you as well. At either, please tell them Pastor Bob Hayes from Africa Christian Training Institute suggested you contact them. A word of caution concerning Internet Travel Sites Make certain you are getting "round trip tickets" and not "point to point." The difference is round trip is a complete package and the same rules apply for baggage and if one flight is delayed and you miss a connection, you will be put on another flight to your final destination whether going or coming. If your bags are delayed, they will eventually catch up with you. With point to point, ticket 1 takes you from point A to point B. Ticket 2 takes you from point B to point C. Ticket 3 takes you from point C to point D. In this scheme, which is always cheaper than round trip, the rules can change from flight to flight and if you fail to arrive at one destination on time and miss the next flight,even if it was in no way your fault, you are considered a "no show" and your remaining tickets will most likely be canceled. Neither the airline that failed to get you there on time or the airline that left without you has any obligation to get you back on track. Airline one will say, "we agreed to get you to pint B and we did that." Airline two will say "we agreed to take you from pint B at a certain time and you were not there so we left without you. Sorry!" To resume travel, you will have to pull out your credit card and buy a "full fare, day of travel ticket" which is always the highest rate there is. Also, with point to point there is a potential baggage fee every time you change planes and delayed bags will suffer the same fate. I have used Internet travel sites and will continue to do so, just beware of the pitfalls. You must have a valid* U.S. passport with an expiration date of at least six months after the end of your trip in order to travel overseas. To get a passport, you must make application several months in advance to make sure it arrives in time. In most cities you will go to the main U.S. Post Office. In the past I outlined the entire process here but forms, web pages, fees, etc., kept changing so it is easier to just say all the info you need is at State Department Passport Services. The documentation (birth certificate, etc.) required to obtain a passport will be returned to in the same package as your new passport. When traveling, I recommend making a couple of photocopies of the photo ID and signature page of your Passport. Take one of the copies with you and keep it separate from where you keep your Passport and leave the other at home where it could faxed to the US Embassy should it be necessary. In many cities the Passport Services window operates on limited hours (e.g. 10:00 a.m. to 3:00 p.m.) so you should call before you go to make sure service is available when you get there. For those needing to replace an expired passport the web page listed above contains that information as well. The web page linked above also contains information for expedited receipt of a passport should you need one in a hurry. It will just cost more money. *A VALID Passport is one that has been signed with black ink, is in good condition, does not expire for at least six months after your planned travel, and has blank pages for inserting entrance visas, upon arrival and departure. U.S. citizens are required to have a Uganda Entrance Visa to enter the country. Effective July 1, 2016 a new online application process was introduced. A lot more information than has been previously been required on the arrival declaration at Entebbe Airport is now required. The cost has decreased to $50 and is payable online via a Visa® or MasterCard® (no other cards accepted). In order to complete the process, you must pay online and they charge you a $1.50 "convenience" fee so your credit card statement with show a $51.50 charge to UG Immigrations fees Kampala. CAUTION! I highly recommend you call your credit card company before you make the charge on the Uganda site. If you do not, many credit card companies will deny the charge and your application process will enter never never land where you cannot go forward, nor can you go back without a lot effort. The credit card issue is due to fraud and to protect themselves, many credit card companies require prior notice you are processing a charge that will originate in Africa. You may wish to print/download this PDF file with DETAILED VISA APPLICATION INSTRUCTIONS. I update this PDF everytime I find that something has changed or been added or I gain more clarity in how to do something. 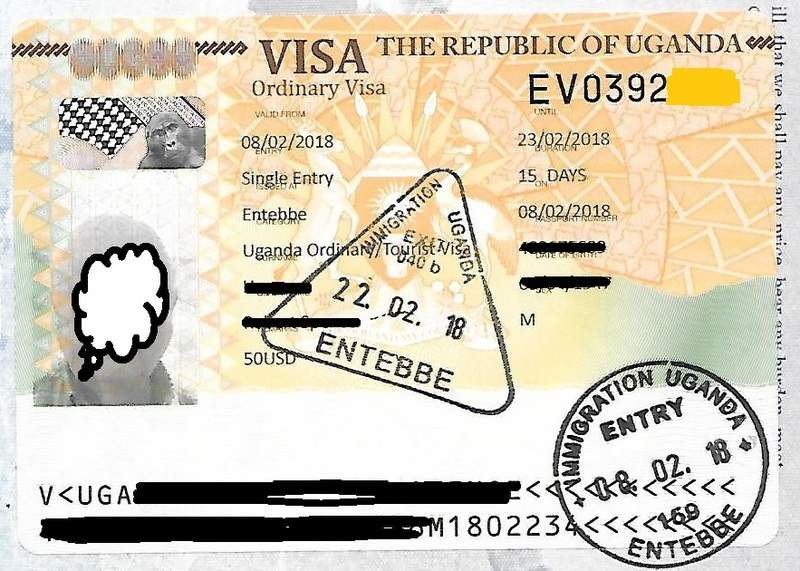 A VALID Ugandan Entrance Visa is now a full page sticker they place in your passport upon arrival at Entebbe. They put a round "Entry" stamp at Entrance, and a triangular "Exit" stamp upon departure.